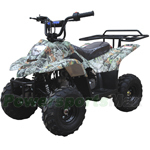 This is a great 4 Wheeler you can buy inexpensive and learn on. The quality of the unit will also mean it will last you a long time. Shipped really f ..